Discounts available for attending multiple events. Register by June 2, 2017 and receive complimentary virtual event pass for each in-person registration. In-person registrants receive $50 discount to also attend EnergyU Administrator Training. Visit the MEA Event Calendar to register or learn more. Early registration ends June 2, 2017. Receive one complimentary virtual event registration for each in-person registration for MEA’s August 8th OQ Success Conference. This early registration bonus ends June 2, 2017. A virtual attendee pass is not the only early registration savings available. Extend your in-person stay through August 10th and receive a $100 discount to attend MEA’s Gas Operations Technical and Leadership Summit. If travel restrictions are preventing in-person attendance, register to attend via livestreaming. Virtual attendees will be able to watch the sessions live and participate in real-time discussions via online chat. Post-event recording and conference materials will be provided. Contact Shannon Anderson (651-289-9600 x110) for information on virtual attendee group discount. Contact Chad Shannon (651-289-9600 x112) if you would like information on event sponsorship. OQ Success Conference – Register Today! Individuals who register by June 2, 2017 to attend the in-person event will receive a complimentary pass for one virtual (livestream) attendee. In-person attendees can also receive additional savings for the Gas Operations Technical and Leadership Summit. 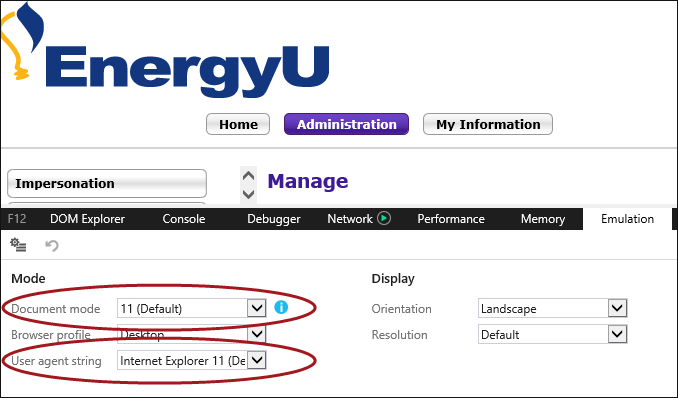 While many users and administrators may be using Internet Explorer 11, we have had incidents where EnergyU was not displaying correctly due to older emulations settings for the browser. With the browser open, use the function key F12 to open the developer tools window. Select the Emulation tab and verify that your Document mode and User agent string are using versions 10 or higher (11 or edge). Please work with your IT department if you do not have the required setting selections. The Reset User Training Data button is back! This button allows resetting of multiple users. We have temporarily removed the button for Reset User Training Data in order to do further testing of this feature. This button allowed resetting of multiple users. While this button is disabled you may still be reset individual users as normal. We will let you know when the multiple user reset feature is once again available. Using IE, we have had a couple people unable to export ad hoc reports since the upgrade. Within a single company there may only be a couple users who experience this issue, so it is definitely related in some way to the computer/permissions. We are currently trying to determine what the exact cause of this issue. Please notify MEA Technical Support if you have problems exporting reports. There is a browser setting in IE that can be changed to speed up ad hoc reporting. 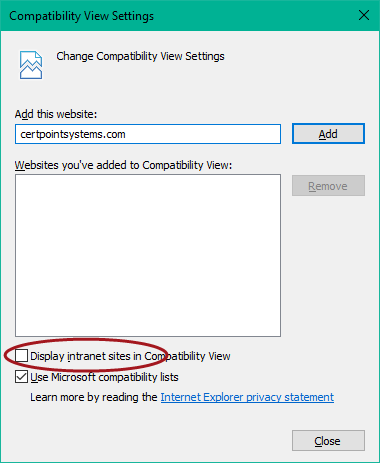 You will want to UNCHECK the box for Display intranet sites in Compatibility view. 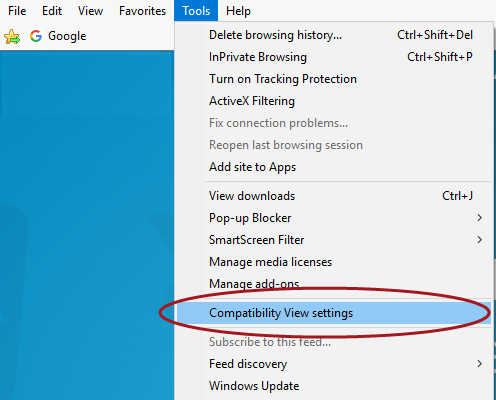 See the screen shots below showing the selection of Compatibility View Settings under the Tools dropdown, and unchecking the box. There is one more issue that has been reported with IE; the occasional inability to type in a field. This is not new to the upgrade and was sometimes experienced in Version 8. This will sometimes occur when there are a lot of tabs open in Admin. Sometimes closing all tabs and reopening the one you want will solve the issue. Also, you can often activate the field you need to access by using the Tab or Shift+Tab keys. This issue has not been reported when using Firefox.